Combine ranch dressing, sour cream and salsa. Mix thoroughly. Portion 3 ounces of Mexi-ranch dressing in individual portion container and place in one corner of salad tray. Wash and thoroughly drain tomatoes and green leaf lettuce if not prewashed. Combine all salad greens and fill salad tray with 2 cups of mixed salad greens. Place 9 - 10 tortilla chips around edge of salad. Heat grilled chicken strips according to package directions. Place 2 1/4 ounces of cooked chicken strips in center of mixed greens. Combine cheeses and weigh 1 ounce to determine serving size. Sprinkle 1 ounce mixture of shredded cheeses on top of chicken strips. Wash and drain cherry tomatoes. Garnish each salad with 3 cherry tomatoes and 2 slices of jalapeno peppers. Cover salads and place in refrigerator until ready for service. Portion 1 salad for each serving. Each portion provides 3 oz. eq. meat/meat alternate, 1 oz. eq. whole grain, ½ cup dark green vegetable, 1/8 cup red/orange vegetable and ½ cup other vegetable. Commodity grilled chicken strips have a different yield than purchased chicken strips, so nutrition analysis will need to be re-calcuated if the commodity chicken is used. See recipe MRS 605 for a recipe using commodity chicken. 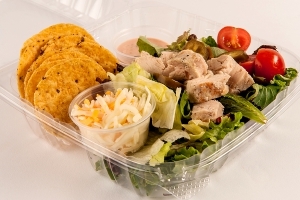 A container allowing space for the salad, tortilla chips and dressing is recommended. Clear plastic lid for eye appeal is preferable. Do not refrigerate tortilla chips. When salad is ready for service, chips should be placed in container. 1 serving of Grilled Fajita Salad.